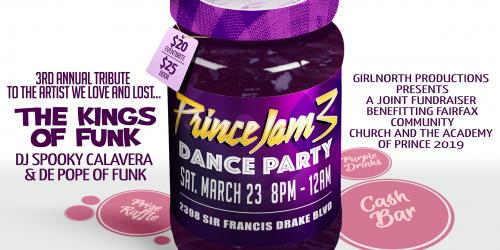 THE PRINCE JAM IS LEGENDARY. IF YOU MISSED THE FIRST TWO THIS IS YOUR YEAR! 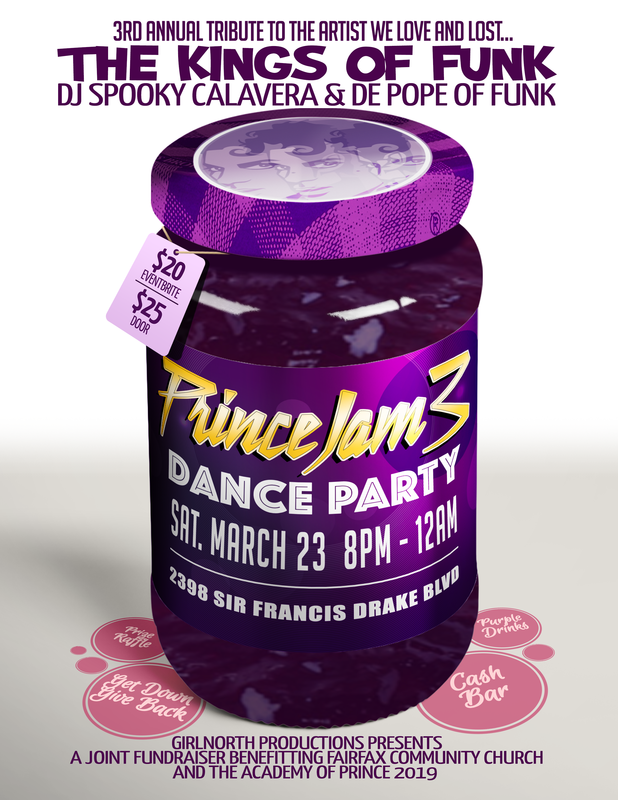 COME GET FUNKY WITH US to the music of Prince, The Time, old school dance jams and The Minneapolis Sound. 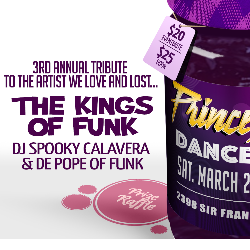 THE KINGS OF FUNK Purple Scholar DJ Spooky Calavera of Purple Funk SF is BACK for his 2nd year at The PrinceJam and NEW this year: the smokin' hot De Pope of Funk! Proceeds go to keep the doors open at Fairfax COMMUNITY Church / The Fairfax Food Pantry and toward The Academy of Prince/Purple Playground in Minneapolis. DJ SPOOKY CALAVERA is a DJ from San Francisco CA and cofounder of the Bay Area fan group Purple Funk SF. A Purple Scholar, Spooky has studied the Minneapolis Sound and the music of Prince intensively and has been spinning purple funk parties all over the world. Spooky sits on the board of trustees for The Purple Playground an organization creating and implementing music education programs that teach the history and the importance of Prince’s musical legacy. Spooky is also a vocalist in the Prince tribute band The Purple Ones with Prince’s former guitarist and music director Levi Seacer. A true Funk Master, he can spin anything from classic to contemporary Funk, Soul, Hip-Hop, New Wave, Jazz, Blues, and Rock and Roll. Spooky has been a professional DJ since 1988. From 1991-1996 he was both a prominent radio DJ and the jazz, blues, and hip hop music director at KUCI FM in Irvine CA. Throughout his illustrious career he has performed all over the world opening up for artists like The English Beat. Spooky is looking forward to rocking with U. 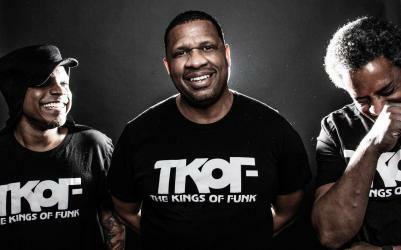 DE POPE OF FUNK, Master DeLonzo Pope, is a Bay Area DJ, artist and martial artist. Funk and Soul have been the backbone of his music since he began spinning as a kid in the late 1970s. He trained at KPOO, spun and mixed for Sunday skaters in Golden Gate Park and created mixes for the Midnight Rollers in SF for years. DeLonzo teaches martial arts and percussion, running multiple martial arts after school enrichment programs in SF and Berkeley. Known for getting every party started with his fine dance skills he was dubbed DePope of Funk in 2017 and is a featured performer at all Purple Funk SF events. 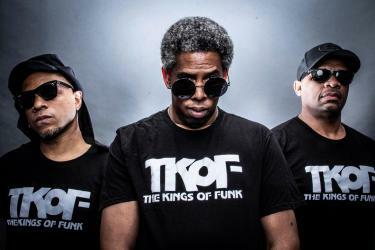 Integral to DJ trio TKOF—The Kings of Funk—DePope of Funk finds synergy and his creative groove with the ensemble. He can't wait for this get down!